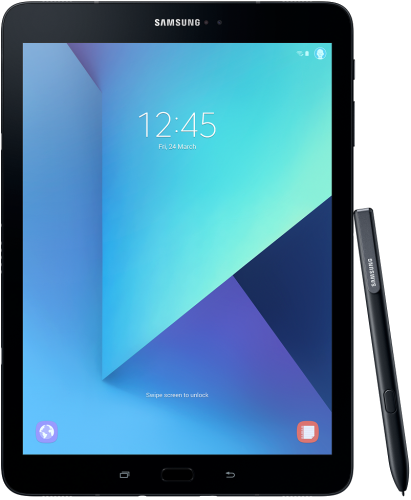 Samsung's Galaxy Tab S3 (LTE) SM-T825 specifications and features: this is a 9.7” (246.4mm) device with a QXGA 2048x1536 screen resolution. The phone is powered by the Snapdragon 820 soc with a Quad-Core 2.15GHz + Quad-Core1.6GHz configuration. Memory is 4GB, with the device offering 32GB internal storage and up to 256GB of external memory. The Galaxy Tab S3 (LTE) features Accelerometer, Hall Sensor, RGB Sensor, Finger print Sensor and Gyro Sensor. The device measures 237.3 x 169.0 x 6.0mm and weighs 434g.